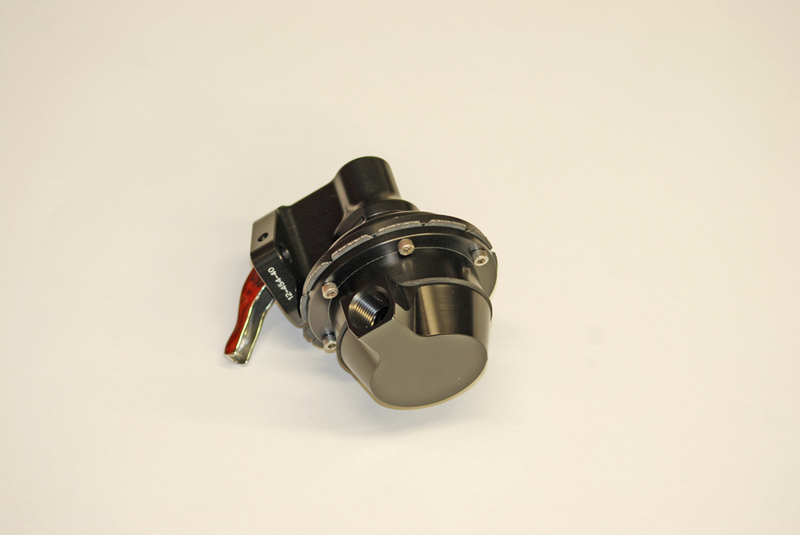 Last issue, we examined the role of the electric fuel pump in a street-strip application. If you recall there were two different types of pumps – one for carburetors and another for EFI applications. When it comes to conventional mechanical pumps, they’re pretty much limited to carburetors only (although some belt drive pumps can be used with fuel injection – they’re highly specialized and far beyond the scope of our series). Read on to find out which type of fuel pump is best for your car’s needs. In operation, it’s probably no secret that the majority of mechanical fuel pumps in use are driven off the camshaft – some by way of a pushrod (such as the big block Chevy jobs shown here), and some by way of an eccentric. With a mechanical fuel pump, as engine speed increases, so does the speed of the fuel pump. Honestly, it a good setup for a street-strip car. Some of today’s mechanical pumps are perfect for a high flow application, plenty are not. Some examples include Holley’s High Output pumps (with or without external fuel pressure regulator), along with Holley’s HP series pump. The basic High Output pump has a gallon per hour rating of 110. The High Output pump with the external regulator has a rating of 130. And finally, the HP pump carries a rating of whopping 170 GPH. The 170 GPH pump requires an external fuel pressure regulator. The Holley 12-454-20 pump is based upon a cast body, complete with a lower housing that can be rotated for various plumbing arrangements. 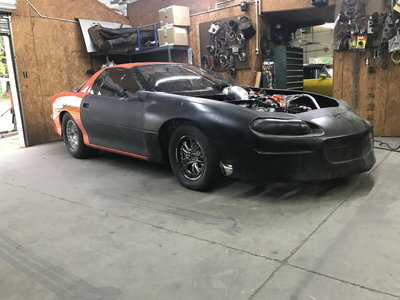 It is pre-set at approximately 8 PSI, which means a fuel pressure regulator is mandatory. This pump has a flow rating of 170 gallons per hour at 8-PSI, it incorporates a cast body with a lower housing that can be rotated. This allows for any number of different plumbing situations. 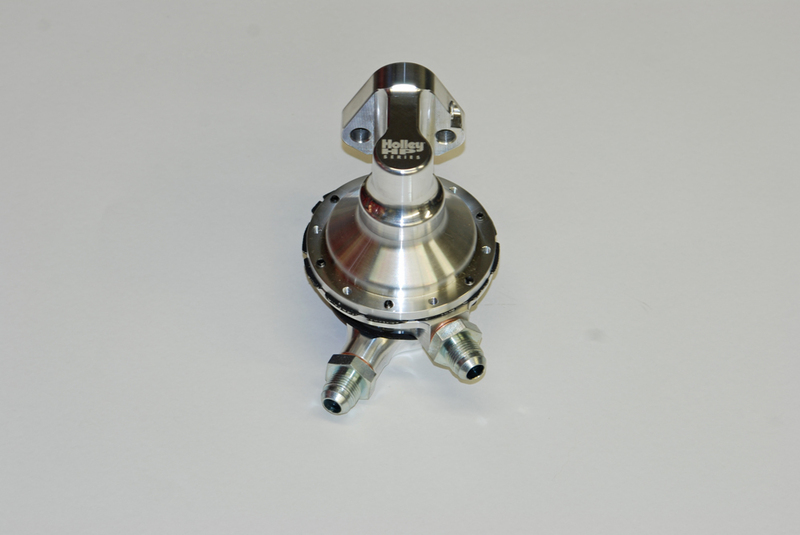 The inlet and outlet ports are machined for -8AN fittings (O-ring configuration). The pump features heavy-duty construction and is designed for continuous high rpm operation. Internally, the high flow valving has been redesigned in order to ensure adequate fuel delivery, and Because of the 8-PSI setting, a fuel pressure regulator is required. Finally, the pump is for gasoline-fueled applications only. 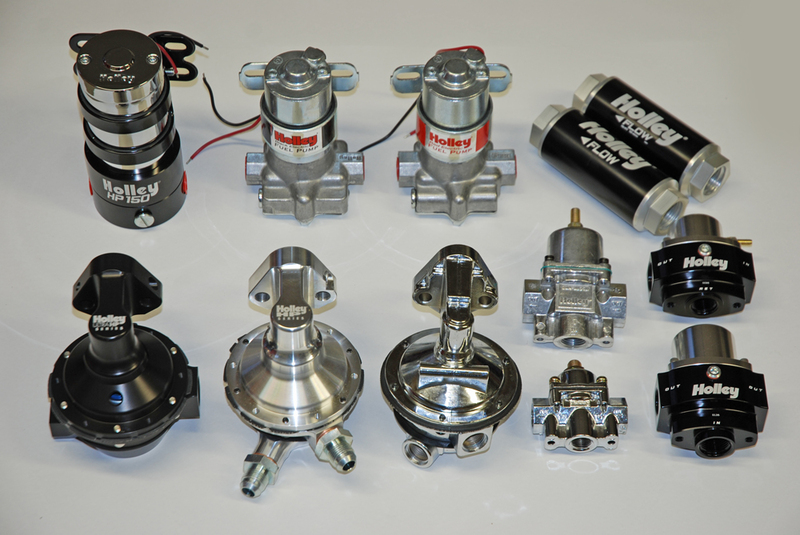 Holley offers a line of billet aluminum body mechanical fuel pumps for various engine combinations. This particular version is engineered to operated at 7.5 PSI (at idle), and in most applications, you can run it without an external regulator (although many do). 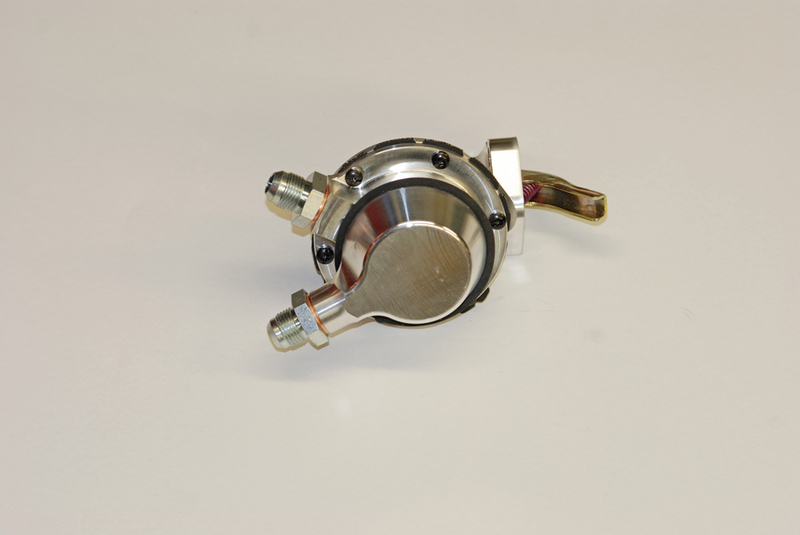 This is one of Holley’s HP billet aluminum body mechanical fuel pumps. It too has a free flow rating of 170 gallons per hour. This pump features a pre-set idle PSI rating of 7.5, which means it can operate without an additional external fuel pressure regulator. The inlet and outlet are both pre-plumbed with -8 AN male fittings, and like the pump above, the lower body of the pump can be rotated for various plumbing situations. The pump is designed for gasoline only. 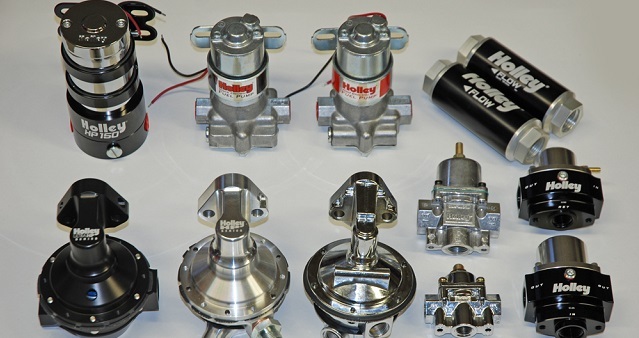 Holley offers rebuild (service) components for these pumps. That means you can rebuild them at home, if necessary. The biggest of Holley’s mechanical pumps is the Ultra HP. This is actually a marine (gasoline) job, but you can also get a similar race pump for alcohol. Bodies are manufactured from billet aluminum and then hard coat anodized. The Ultra HP is a powerful pump (200+ Gallons Per Hour) and Holley mandates a specific service schedule. See the text for details. The last pump we’ll look at is actually a marine fuel pump, however we believe it can also be used successfully on a race car too (the pump is likely too aggressive for street duty – more below). It’s a black anodized billet aluminum body Ultra HP job, with a flow rating of a whopping 200 gallons per hour. 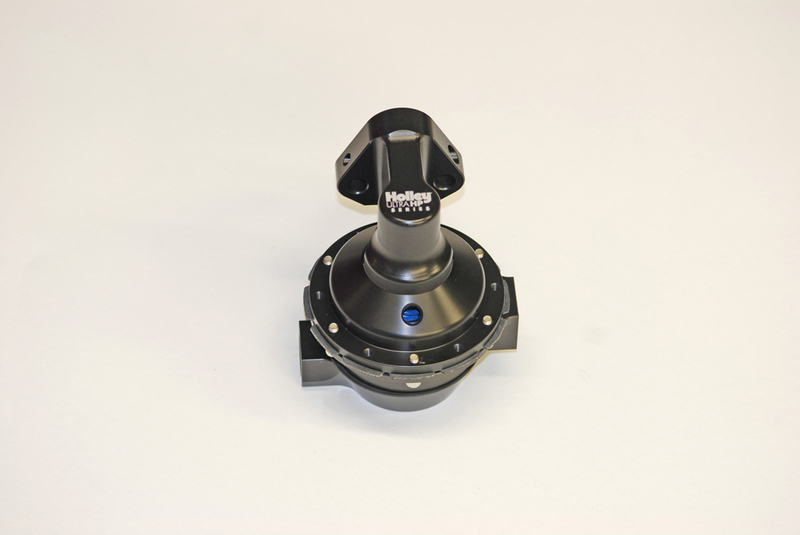 The body is actually machined from 6061-T6 aluminum and it’s hard coat anodized for corrosion protection. 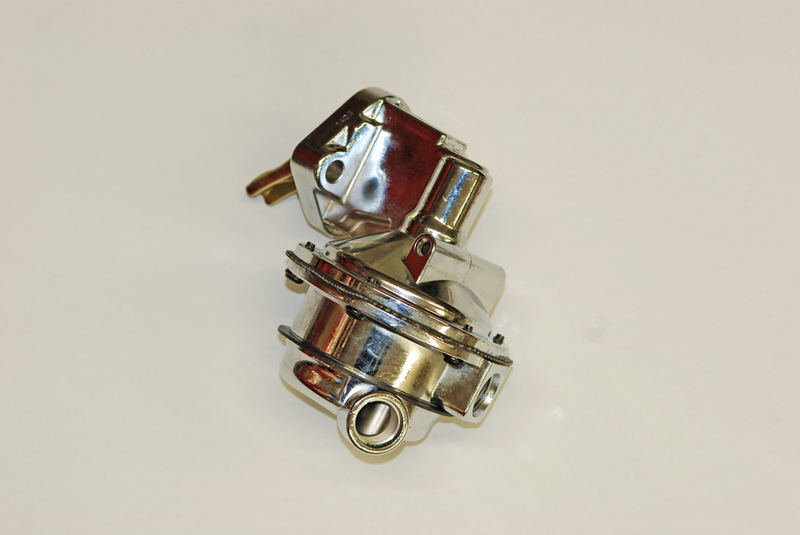 The inlet and outlet ports are machined for ½-inch pipe thread, but fittings are not included. Like the other pumps, the base can be rotated, but there’s a difference here – the lower base (inlet) can be rotated independently of the upper base (outlet). Basically, the lower pump body is a two-piece affair, which (obviously) adds to the versatility. The pump is designed for use with gasoline (although a similar alky job with a 225 GPH rating (!) is available). This particular gasoline fuel pump is designed for use with an auxiliary fuel pressure regulator. We’ll get to those in another issue. Similar to the HP billet pump above, the Ultra HP jobs are fully serviceable. Holley actually has a maintenance schedule for Ultra HP fuel pumps such as this. The diaphragm assembly should be replaced every 750-1,000 hours. During the rebuilt, the gaskets should be replaced (kit number is 12-757). The fuel pump lever arm should be examined for excess wear, and replaced as necessary. Finally, when the pump is apart, Holley recommends you inspect the valve body for damage to the rubber diaphragms, and replace as necessary. This is one serious mechanical pump! Next issue, we’ll examine fuel pressure regulators. Stay tuned.